Seth Punchard Storage & Distribution is a family run business based in Wirksworth, Derbyshire and supplies transport solutions to the general haulage industry. Sarah Punchard (Partner) explains how Seth Punchard Storage & Distribution have improved their driver training records and become a more efficient and cost-effective transport company through being FORS GOLD accredited. In 2014 we realised that we would need to become a FORS member to allow us to make deliveries to sites within major cities such as London. However, it has also helped us update and improve the company’s policies and procedures by working within the FORS Gold standard. We passed our first Bronze audit in March 2014; however, we were encouraged to commit ourselves to improving standards further by increasing fleet efficiency, safety and minimising our environmental impact. Once we attained FORS Bronze we really made the most of the benefits on offer, in particular the practitioner workshops. We now have two fully qualified FORS practitioners and this helps us implement and maintain the FORS Gold standard. Having two FORS practitioners has improved the everyday running of the business which is now more efficient, cost effective and profitable. Initially we joined FORS to demonstrate our commitment to best practice, however FORS Gold has improved safety standards and reduced our environmental impact by inspiring us to implement a noise assessment policy and reduce our carbon footprint. Although these figures don’t reflect an improvement, I believe this is due to incorrect data on the performance management system. There have been mileage discrepancies that have over inflated the previous year’s MPG. • Driver health and fitness is very important to us and we regularly perform eye sight checks. We also have a health and fitness questionnaire which is reviewed every 5 years. In the future we would like to perform health checks more regularly and introduce a more in-depth health and fitness check with a qualified professional. • To recruit drivers, we have employed young and inexperienced drivers and financed their initial driver training. We have also replaced many of our older vehicles with brand new HGVs to improve driver retention. • Noise pollution will become more problematic in the future particularly if we decide to move premises. We currently have audible warning equipment that can be switched off during unsociable hours and encourage anti idling by requesting our drivers to switch off their engines whenever practically possible. • Modal shift and alternative vehicles are something we will consider as the technology evolves and becomes more affordable. The last 12 months have been very productive. We have increased our fleet and replaced old vehicles with brand new Euro VI HGV’s. These new vehicles have better fuel efficiency, which not only improves our environmental impact by reducing our carbon footprint, but also improves health and safety standards and reduces vehicle downtime. • Driving licences are now checked every month using the Government website and we have a driver’s policy that requires employees to inform us of any changes to their driving licence or driving ability. • We have most recently taken on our own in house mechanic to improve safety standards. Having our own mechanic is financially beneficial to the business as we no longer have large invoices from external contractors. This allows us to spend more time and money improving our fleet and enables us to respond more quickly and efficiently to breakdowns, therefore reducing downtime and company costs. We can now focus on preventative maintenance which will pay dividends in the future. • In June this year we were approached by organ donation to take part in the charity event ‘Walk for life II’. 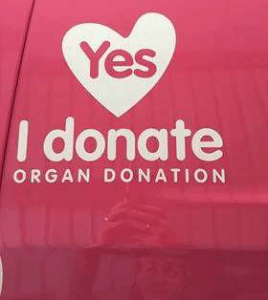 We were very proud to support this charity event and had their logos fitted to our vehicles in the hope that this would inspire people to join the organ donation register. We were privileged to be allowed to display the logos on our vehicles and believe this collaboration will benefit both parties. • Going forward I would like a driver’s handbook that can easily be edited to incorporate industry changes, it would also need to be concise so that it is easy for our employees to read and understand. This will help our company stay compliant and work within the FORS standard. Becoming a FORS Gold Accredited member was a massive achievement on both a personal and professional level. We are a small family run business, competing against much larger companies that have staff dedicated to FORS development and progression. We are very proud of our achievements within the last 12 months and are committed to improve our environmental impact and fleet efficiency in the future with more brand-new euro VI HGVs due to arrive in 2019.